These are optional. You can choose to have dynamic dropdown fields on your generated pages. For example: You are designing an input form and you need users to specify which State or Province they are from. 1. Select which field you'd like to appear as a drop down list on the generated pages. 2. Choose the table containing the data you'd like to appear in your drop down box. Continuing with the example from above, you would choose states , the table containing the names of each each state, and their abbreviations. 3. Choose the name of the field in the "linked" table you specified above that contains the data you actually want to be stored in your table. In the case of our example, this would be the states abbreviation since you only want the state abbreviations stored in the employees table. 4. Choose the name of the field in the "linked" table you specified above that contains the data you want displayed from the linked table. In the example above we chose to store the abbreviation in the first table but when that data actually gets displayed it will associate the abbreviation with the actual state name. At this time because you have supplied all the information required to add a drop down field, click the ADD DROPDOWN button. If you change your mind, you can make the field no longer of type drop down list, by simply clicking on the appropriate line in the list of drop down fields. The order in which you add these dropdown field specifications does not matter. These are a list of category links that will show up on the Menu page to allow you to jump to the search results page and narrow the search to items from a specific category. The categories will be pulled from the chosen dropdown menus. 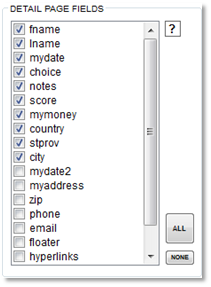 You can choose which dropdown menu choices you would like to use as a category list by selecting the checkbox for that fieldname. From our example above where we have a dropdown menu of available state/provinces we can now choose to have this list of state/provinces show up in a bulleted list on the Menu Page. People can then quickly just to the search results page narrowing their search to a specific state/province in this example.